The 502nd Soundtrack of the Week is one of these theme compilation CDs. I don't usually bother with these but this one grabbed me for some reason. It's called Danger Men, Mavericks, Thrillers and Twilight Zones. The cover art is nice and the first track is a favorite of mine, the theme from Adventures in Paradise, a perfect bit of island exotica. The collection is all over the place, from the "Funeral March of a Marionette" from Alfred Hitchcock Presents to the theme for Disney's Zorro television series, from Route 66 (another favorite!) to the menacing opening theme for Quatermass and the Pit. One discovery was "Tracy's Theme" from The Philadelphia Story, not the famous movie but a lesser known tv movie from 1959. At least I assume that's what this is from. It's definitely not from the older film. There are several western themes and Richard Chamberlain's vocal take on the theme from Dr. Kildare. So this is a solid and eclectic mix of the usual and unusual suspects. I'm glad people are still putting together compilations like this. A curious email came from Bill Frisell's official website this morning. The content of the email is also on the website. Its subject is Frisell's new forthcoming album, a solo guitar recording. The curious part is this: "It is his first solo album since the making of Ghost Town, released on Nonesuch, over twenty years ago". This is curious because Frisell recorded and released a solo guitar album in 2013, Silent Comedy, on John Zorn's Tzadik label, a mere five years ago. Interestingly, a few years before Silent Comedy came our, I'd heard that Frisell's management had talked him out of making such a record for Tzadik, on the grounds that this free-form, noisier side of him, in such a large dose and uncut by familiar tunes or hummable melodies, would be bad for his career. It didn't seem to have any adverse effect on his career but it is curious that this press release pretends it didn't happen even though it is included in his official website's discography. 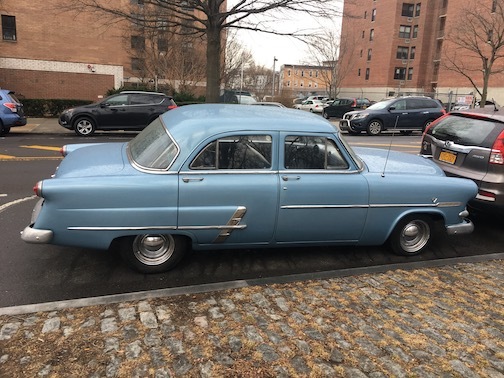 Spotted on Prospect Park Southwest the other day, this beautiful old Ford with a historical license plate. 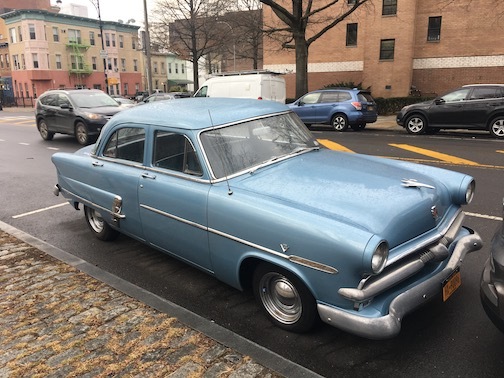 According to the NYS DMV, that means that it has to be at least 25 years old and "the vehicle must not be used for daily transporation". Which might explain why traffic doesn't look more interesting. 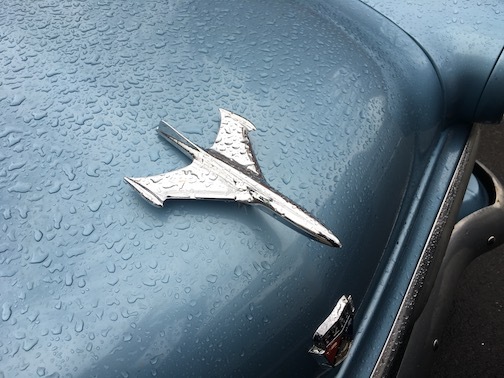 Anyway, here it is, with its magnificent hood ornament! 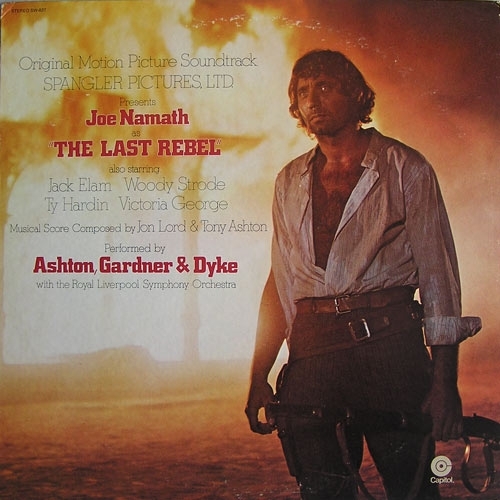 For the 501st Soundtrack of the Week we're listening to one of the best rock soundtracks ever, The Last Rebel, which has a score by Deep Purple's Jon Lord, several tracks co-composed by Lord and Tony Ashton, with the latter's group Ashton, Gardner & Dyke taking on the performance duties. Oh, yeah, and the Royal Liverpool Symphony Orchestra. Quite a production! You'll hear straight ahead rock, jazz and classical influenced pieces, weird atmospheres and dramatic underscore. Since Lord and Ashton were both keyboard players, that instrument takes the lead in most of the tracks. It's all over the map. "Stage Coach Ride" is a wild Latin-jazz mutation freak out of what once might have been a Vince Quaraldi-ish piano trio tune. "Surrender" is a synth and/or electric piano that veers into Sun Ra/electric Miles territory, sounding like ominous horror movie mood music and then quoting "Oh! Susanna" out of nowhere. The favorite has got to be the main title theme, though, which is in a rocking 7/4, starting out with the orchestral treatment before shifting into psychedelic rock band mode. That kind of thing was fine on The Dukes of Hazzard, as it cleared the way for a commercial break, but if it's deployed in the movie out of necessity or convenience, it doesn't bode well for the film itself. Also on here are deep groove and funk pieces, love themes, a whole lot of different things. It's really one of the most fun and satisfying score CDs I've heard in a while. Thomas Ligotti is one of the few living authors I know of who write "weird fiction" and "weird tales". This interesting book, My Work Is Not Yet Done, collects three such stories, two short and one long. The title piece is a novella that starts out normally enough as a satire of corporate office life and "culture", if that's the right word. This is certainly a worthwhile environment for satire, pervasive and powerful and dehumanizing as it is. Ligotti sketches it neatly and clearly. The company that employed me strived only to serve up the cheapest fare that its customers would tolerate, churn it out as fast as possible, and charge as much as they could get away with. If it were possible to do so, the company would sell what all business of its kind dream about selling, creating that which our efforts were tacitly supposed to achieve: the ultimate produt — Nothing. And for this product they would command the ultimate price — Everything. This market strategy would then go on until one day, among the world-wide ruins of derelict factories and warehouses and office buildings, there stood only a single, shining, windowless structure with no entrance and no exit. Inside would be — will be — only a dense network of computers calculating profits. Outside will be tribes of savage vagrants with no comprehension of the nature or the purpose of the shining, windowless structure. Perhaps they will worship it as a god. Perhaps they will try to destroy it, their primitive armory proving wholly ineffectual against the smooth and impervious walls of the structure, upon which not even a scratch can be inflicted. While the tale begins in a recognizable setting, it smoothly switches tracks from mundane white collar horror of the most familiar kind to supernatural vengenace limited only by our narrator's will and imagination and, crucially, one other mysteriously finite resource. The short story "I Have a Special Plan for This World" subverts the capitalistic imperative of constant growth by having as the main character an employee whose special gift is, perversely and ironically, to enable such a thing, in a certain way. In this case, it involves the gentrification and rebranding of an urban neighborhood known as Murder Town into Golden City, to which our narrator's company relocates. A yellow fog pervades Golden City, growing larger and thicker as the number of murders increases — and increase it does. Finally there's "The Nightmare Network", which is reminiscent of J. G. Ballard both in content and in presentation, a series of short bursts of writing, some no longer than a paragraph, each with its own heading, e.g., "Orientation video" or "CLASSIFIED AD III". Major Supercorp in the process of expanding its properties and market-base has limited openings for Approved Labor in domestic and off-shore sites (real and virtual). We are among the biggest legitimate multi-monopolies on the world scene and our Corporate Persona is one that any AL can adopt in good conscience. Experience in sensory-deprived conditions preferred. Knowledge of outlawed dialects on the Nightmare Network a plus. Standard survival package of benefits. Prehistoric ALs okay with biologic documentation from transport agency. 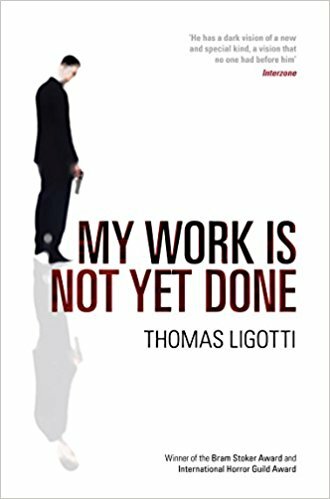 Among the many pleasure of this book, the imagination, the tone, the targets, the unexpected destinations, one of the most pleasing is Ligotti's writing itself. It's old-fashioned in a good way, reminding this reader of the weird tales from a hundred years ago but very much up to date, not a pastiche but the style of a strong, inventive, literary writer. The 500th Soundtrack of the Week! This is a milestone! And how better to celebrate than with literally the first soundtrack I happened to glance at today? It's no big deal, just John Barry's music for The Legend of the Lone Ranger. This is a curious record. It finds Barry in mid-career and you'll hear echoes of his music for Moonraker as well as anticipations of some of his later concert music and tinges of disco seeping into the frame. What you won't hear much of, though, is much in the vein of some of his better known western writing, such as The White Buffalo or his sprawling and award-winning Dances With Wolves score. The harmonica, which Barry loved to use as an "American" element in his composing, does a lot of the work in the music here, while fans of Barry's particularly powerful way of writing for strings will be happy with many of the moods and melodies he comes up with here. I wonder if this movie was any good at all. 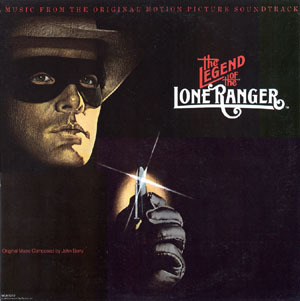 Merle Haggard sings the theme song "Man in the Mask" (not a high point for anyone involved but decent) and, more ominously, narrates some chunks of exposition for two other tracks, "The Legend Begins" and "The Breaking of Silver". 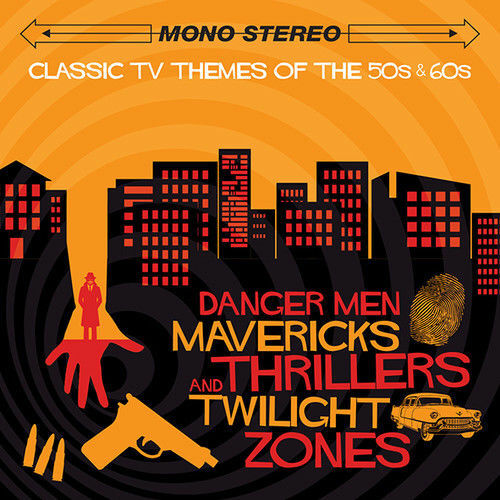 If you grew up with The Lone Ranger on radio or television, then you can't think of it without hearing the "William Tell Overture", and Barry dutifully comes up with his own nimble, airy and fleet rendition of it. Also of interest are "Ambush" (which is in 9/8) and the driving and soaring "The Valley Chase" (which is the piece I'd want in my head coming out of the theatre. John Barry completists and even non-completist fans should enjoy most of this record. A complete and chronological release would be most welcome, assuming there's a good deal from this score still unreleased. Somewhere not very long ago we picked up an old record by Tommy Garrett or, to be precise, The 50 Guitars of Tommy Garrett. We didn't know anything about it but it's the kind of record we buy. It was really great and had fantastic interpretations of three Ennio Morricone pieces, the main themes from The Good, the Bad and the Ugly, A Fistful of Dollars and For a Few Dollars More. It turns out that Garrett, who was a record producer nicknamed "Snuff", made a bunch of these "50 Guitars" records in the '60s and they were pretty popular. There doesn't sound like anything near fifty guitars, but his concept was to get a bunch of great session guitarists—Barney Kessel, Tommy Tedesco, Laurindo Almeida et al.—playing together (similar to Hank Marvin's Guitar Syndicate, which would come along later). 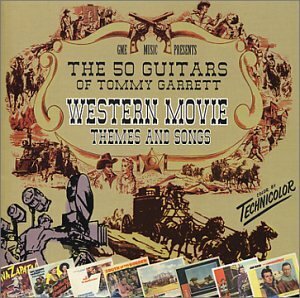 And so the 499th Soundtrack of the Week is this compilation of Western Movie Themes and Songs by The 50 Guitars of Tommy Garrett. It kicks off with the aforementioned theme from The Good, the Bad and the Ugly, which should really grab you. The other two Morricone spaghetti western themes are on here also, and the version of the theme from A Fistful of Dollars is especially well done, and as much of a feature for the harp as it is for the guitar. Of course Elmer Bernstein's The Magnificent Seven theme is on here, and it's energetic and has a rich, full sound. Many of the other songs are staples as well: "South of the Border", "Mexicali Rose", "Green Leaves of Summer", "Yellow Rose of Texas", the theme from Giant etc. What's perhaps most remarkable about these recordings is how good the guitar sounds, especially the nylon string guitar. It's exceptionally clear and bright, even when surrounded by all this percussion and strings and whatever else. Even when several guitars are playing in unison, there's a strong sense of clarity and depth. I'm going to spend some time with a few of these "50 Guitars" albums and see what happens. We've been very slapdash with our writing here and despite any resolutions we might have made, the 498th Soundtrack of the Week is going to be the slapdashiest one in a long time. 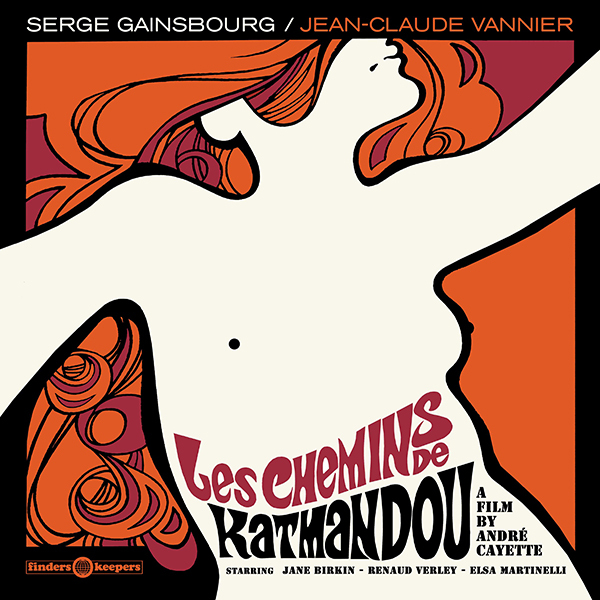 We regret that we do not have the time to say more about Serge Gainsbourg and Jean-Claude Vannier's music for Les Chemins de Katmandou. Real quick: lots of space, deep grooves, clavinet, sonorously beautiful electric bass and strings, ethereal vocals, definitely recommended for Melody Nelson fans. And also cheers to Finders Keepers for discovering the tapes for this! For decades it was assumed that they had been destroyed in a studio fire. Now go do something good!